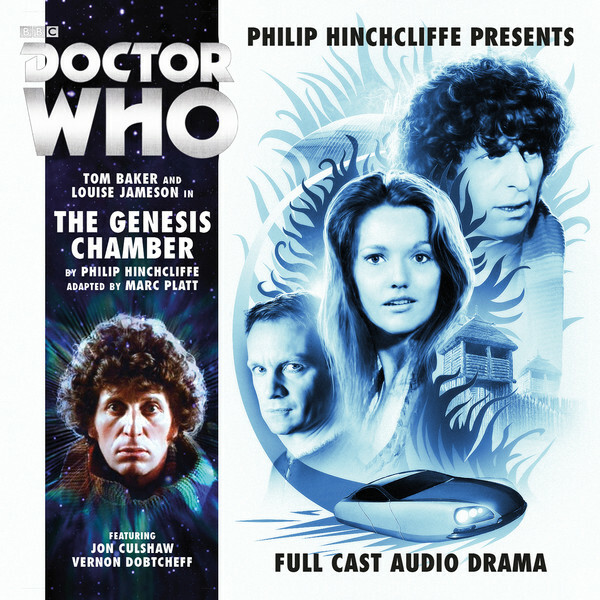 Big BIG FINISH Week: Philip Hinchcliffe Presents Volume 02: THE GENESIS CHAMBER Review | Warped Factor - Words in the Key of Geek. Matthew Kresal finds a lot to like in the new Fourth Doctor adventure from Big Finish. I have to admit that I've been on something of a hiatus from Big Finish for the last couple of months. Having found myself bitterly disappointed by the recent Tenth Doctor audios and unimpressed by a number of other recent releases, I needed a story to get me going again and remind me of what Big Finish is really capable of. The Genesis Chamber, the second release from the Phillip Hinchcliffe Presents range of Fourth Doctor tales, was just the ticket. A large part of what makes this release work so well is its script. The teaming up of Fourth Doctor era producer Phillip Hincliffe and writer Marc Platt proved to be a winner with the first box-set back in 2014 and this new story was no exception to that rule. Much like Hinchcliffe's TV era, Genesis Chamber takes familiar ideas and puts a new spin on them, this gives them a feeling of freshness they might otherwise lack. There are echoes of TV stories such as Face Of Evil, with two very different human societies separated by a technological gulf threatened by an outside force, plus the titular device is almost certainly a variation on the looms idea from Platt's own legendary (and near impossible to find) novel Lungbarrow. What makes this release stand out is what the pair do with those basic ideas and how this Doctor and companion combination react to them, including an outside threat and the story's ultimate resolution. “There's no such thing as new ideas,” someone once said, but there is the configuration of older ideas into something fresh and this release goes a long way to proving that can work well. Perhaps because of Hinchcliffe's involvement, both Tom Baker's Fourth Doctor and Louise Jameson's Leela have rarely sounded as good as they do here. Baker's Doctor alone is worthy of the price of admission as he gives what might very well be his best Big Finish performance to date taking in the full scope of the role from humorous to serious (the best bits of the story may be when the Doctor ends up on the proverbial warpath) in a way that has seemed lacking from many of the other Big Finish Fourth Doctor Adventures. Jameson's Leela meanwhile also get the chance to shine with a script that makes fine use of both character and performer, including some nice character moments and wonderful interactions between the pair. It really does feel like it's tea-time 1977 all over again, just as Big Finish promised back when their Fourth Doctor audios began. The supporting cast is solid as well. Though perhaps under-utilized, Jon Culshaw (famous for his Fourth Doctor impression from BBC radio series Dead Ringers) does a good job with the material he's handed playing the leader of a city increasingly under siege. Gyuri Sarossy's Volor is an interesting characters with quite a few layers to him both literally and figuratively, which make him a fine villain in the best tradition of the Hinchcliffe era. Jemma Churchill does a nice job playing both Culshaw's wife and the voice of the all important InScape computer, keeping them different enough that it was only when I looked at the cast list that I realized it was the same actress. The supporting cast is rounded off nicely by Hannah Genesius as Ana, Dan Li as Grillo, and Arthur Hughes as Shown. Though some are underused it's still a fine cast who do an admirable job filling out the world of the story. Last but not least is the sound design and music of Andy Hardwick. Hardwick brings the settings of this story to life, from the city and commune where much of it takes place and other locations in-between. Hardwick also has the unenviable task of portraying some very visual elements on audio which he proves more than up to. Hardwick's score is interesting as well since, unlike the original Hinchcliffe Presents set, it doesn't take after the Dudley Simpson scores of the era but instead has a far more orchestral sound. In fact there are times when the score echoes that of the New Series in a way that the Tenth Doctor audios simply didn't. Hardwick's work is simply the icing on the cake of this release. On the whole, The Genesis Chamber is one of the strongest Big Finish releases in recent memory. From the excellent story from Hinchcliffe and Platt to its performances and sound design, it could well be the company's best Fourth Doctor release to date and is an all around showcase for what Big Finish can do. Here's hoping there's more to come from the Hinchcliffe Presents range, especially if they continue to be of this quality.